More than 4,000 Ghanaian school children who were present at this year’s World Oral Health Day grand durbar submitted a petition to the government of Ghana to make oral healthcare a priority in the country. This was initiated by Pepsodent as part of its plea to the government to act on mouth health to the state of oral health in Ghana and beyond. At this year’s commemoration of the World Oral Health Day at the Independence Square, the children signed their petition with their thumbprints. 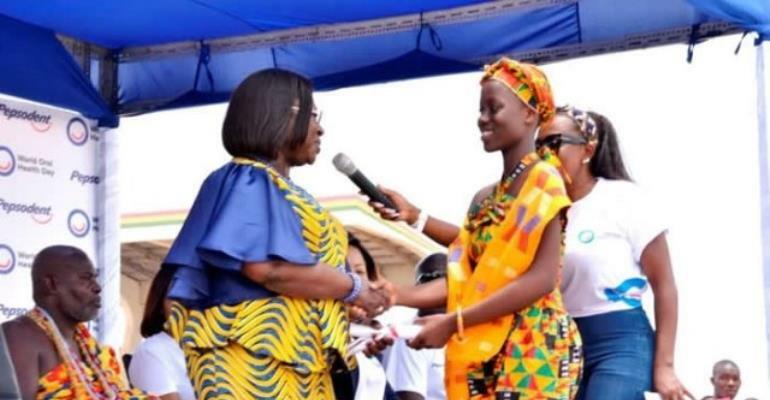 One student flanked by a cadet corps marched to present the petition to the Chief of Staff, Mrs Akosua Frema Osei Opare to be submitted to the President, Nana Akufo-Addo on their behalf. The colourful ceremony brought many influential people from the Ghanaian political, media, health and entertainment sectors. Dentists educated the children on the importance of brushing day and night and the correct brushing technique, to enable children grow up confident with great smiles. World Oral Health Day is a day set aside globally to raise awareness for the issues of oral health. In Ghana, Pepsodent champions the celebration of world oral health day, in partnership with the Ghana Dental Association to promote good oral hygiene in Ghana. The first ever global audit of the impact of oral care on the development and performance of children, which included children in Ghana, discovered that the quality of a child’s oral care has repercussions beyond just health; it limits a Ghanaian child’s potential. The Chief of Staff took the petition in good faith and promised to deliver their request to parliament. Please click on link to read and sign the petition to help make a difference.